Opinions on the newest prince of the Pridelands! Personally, I am in love with him! He's just so cute both as a cub and as an adolesent lion... Anyways, what do you lions think? ......... OK....... Sure! He's all that and a bag of chips. That is awesome! I use him as insperation too! I wrote a song thinking about him once, came out pretty well. It's really nice to be good friends with another Kovu fan. It's still a work in progress, and it's orchestration. 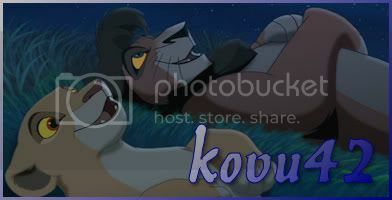 C'mon guys what does everyone else think of Kovu? Kovu is the hottest lion in the Pridelands.